Little did I know when I planned to write this article, we would have a week with temperatures in the sixties and even reach the seventies for a few days in February. It does feel as though spring is arriving early this year. However, leaves are not out yet and you can still walk through the woods and find some of the early harbingers of spring. One of my favorites is the skunk cabbage (Symplocarpus foetidus). Much maligned for its smelly foliage, inconsequential flowers and leaves that start to melt down in late spring; it has wonderful qualities as well. When the forest floor is still completely brown with old leaf litter, you can find the unusual flower buds peeking up through the leaves. 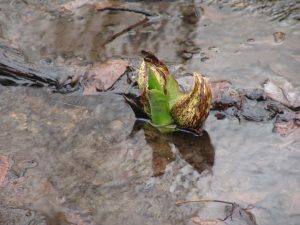 Look in wet woods where skunk cabbage is plentiful and you will find four-to six-inch high hood-like leaves that enclose the flowers. Some leaves are deep wine or red and others have mottling with patches or stripes of yellow or yellow green. The leaves usually twist and eventually open to reveal a round flower head peering out. The flower is a cluster of petal less flowers with stamens that protrude, giving it an interesting texture. Skunk cabbage is one of the first flowers available for our pollinator insects. Bees are already out visiting flowers this spring, and they are finding skunk cabbage pollen to bring back to their hives. The large, wide leaves emerge after the flowers. Their chartreuse green color is stunning in the otherwise barren woods. Skunk cabbage grow in moist conditions and only last a few months. The leaves start to die back at the end of spring/early summer. However, their early flowers are a fun find and their colorful leaves brighten up the bleak woods at the end of winter. Another early spring ephemeral (plant that comes up in spring and dies back to the ground before summer) is Virginia bluebells (Mertensia virginica). Virginia bluebells have bell-shaped (duh!) blue flowers borne on spiral shaped cymes at the end of arched stems. Some flowers are pink, especially in bud. This flower is another bee and butterfly favorite. Its bright green leaves also brighten the forest floor in early spring. Bloodroot (Sanguinaria canadensis) is another early bloomer with white flowers that come out before the leaves in early March. Delicate white petals and yellow stamens are quite showy. Leaves emerge after the flowers, are a fleshy consistency, and spread out to a wide toothed platter shape. Bees and flies pollinate bloodroot, but ants spread their seeds. If you are tired of looking down at the forest floor for spring interest, look up. Red maple is blooming now! The flowers have very small petals, but the bright red stamens are showy enough that trees look red when viewed from a distance. We will probably still have some cold weather to endure at the end of winter and beginning of spring, but seeking out the early blossoms and bright, cheerful leaves of these native woodland species can provide some diversion before the weather warms up completely. Enjoy! Mottled twisted leaves are covering early flowers and a few bright green leaves are starting to open on this skunk cabbage growing at the edge of a stream.